Institution of Automobile Engineers President 1908-09. Sir Dugald Clerk (1854-1932) was a Scottish engineer who designed the first two-stroke engine in 1878 and patented it in England in 1881. Clerk's name is also rendered as Clark in some sources e.g. the University of Glasgow where his papers are archived. He was a member of the Royal Society and winner of the RSA Albert Medal in 1922 under Clerk and the international intellectual property firm he formed with George Marks is Marks & Clerk. The Encyclopedia Britannica lists him under Clerk. Sir Dugald had no children but his nieces, nephews and their descendants have always used Clerk. The Clerk cycle engine uses a similar valve arrangement to the four stroke cycle diesel engine, with both exhaust and inlet valves in the cylinder head and operated by a camshaft. At the end of the power stroke, both exhaust and inlet valves open, and the cylinder is filled with fresh air supplied by a supercharger, which replaces or scavenges the exhaust gas. As no fuel or lubricant has been added to this inlet air, some loss through the exhaust manifold is not serious. The inlet gas is then compressed in a compression stroke, and the fuel injected approaching top dead centre and ignited as in a four stroke diesel engine. The Clerk cycle was used in large engines powering railway locomotives and ships, and was adopted by General Motors in the United States to form the Detroit Diesel Company. The Clerk cycle was not adapted to gasoline fuel, nor to smaller engines. The gasoline two stroke cycle, and the concept of cylinder ports replacing head valves, were both later invented by Joseph Day. Day's inventions were subsequently adapted for two-stroke diesels, and modern two-stroke diesels of all sizes either incorporate elements of both designs, with cylinder port inlets and cylinder head exhaust valves, or use cylinder ports for both inlet and exhaust. Saw a Lenoir gas engine at work in a joiner's shop in Glasgow which influenced him to take great interest in the internal combustion engine for the rest of his life. 1883 Married Margaret Hanney (d.1930), elder daughter of Alexander Hanney, of Helensburgh. 1888 Started practice as consulting engineer in Birmingham. Joined his friend George Croydon Marks in partnership as consulting engineers and patent agents; this partnership lasted for the rest of his life. From 1902 he was a director of the National Gas Engine Co, of Ashton under Lyne. 1904 US Patent for Explosion engine. Henry Nield Bickerton: Henry Wentworth Bradley: Dugald Clerk. He was frequently a judge at the reliability trials which were fashionable in the early days of the motor car. WWI Director of engineering research at the Admiralty (1916–17). Also chairman of the water power resources committee of the conjoint board of scientific societies (1917) and a member of the water power resources committee appointed by the Board of Trade in 1918. Sir Dugald Clerk was born at Glasgow in 1854 and served his apprenticeship with the firm of H. O. Robinson and Co. He then spent some four years in the study of physics and chemistry, and in 1877, on taking up a position with Thomson, Sterne and Co of Glasgow, commenced the experiments on gas engines, with which his name was subsequently identified. He commenced in business as a consultant in 1888 and afterwards became a Technical Director of G. Kynoch and Co and of the National Gas Engine Co.
During the War he was Director of Engineering Research at the Admiralty, a Member of the Advisory Committee for Aeronautics and Chairman of the Internal Combustion Engine Committee at the Air Ministry. For his war services he was awarded a Knighthood of the British Empire. He was elected an F.R.S. in 1908 and honorary degrees were conferred on him by the Universities of Manchester, Liverpool, Leeds, Glasgow and St. Andrews. He was the author of a standard work on gas, petrol and oil engines and of many scientific papers, and was a contributor to the "Encyclopdia Britannica." He died on 12th November, 1932, at the age of 78. He was President of the Institution of Automobile Engineers during the Session 1908-9 and elected an Honorary Member in 1928. 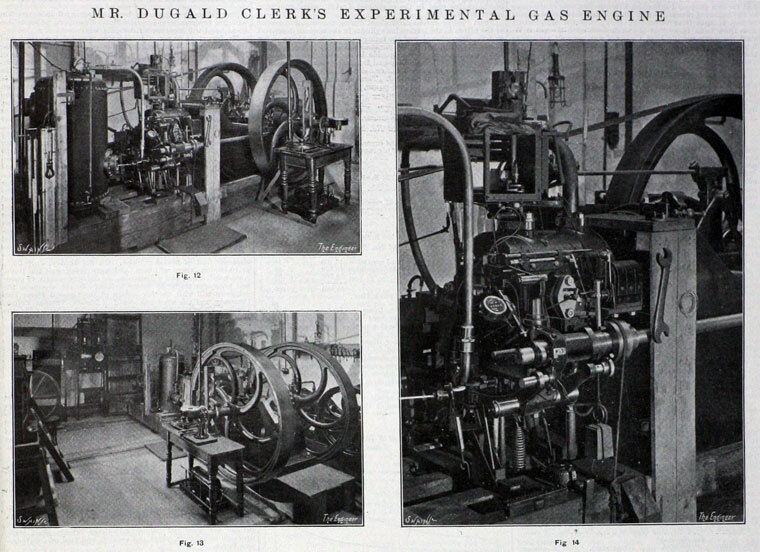 Sir DUGALD CLERK, K.B.E., was one of the pioneers in the development of the internal-combustion engine and achieved world-wide fame through his discoveries and inventions in connexion with it. He built his first gas-engine at his father's works in 1876. In this engine an explosion compressed air into a reservoir and caused a partial vacuum in the explosion chamber and the vessel connected with it. At this period he had been engaged in academic work. He was born in Glasgow in 1854 and first trained in his father's works, which he entered in 1868, and later as a pupil with Messrs. H. O. Robinson and Company of Glasgow. He then studied chemistry and physics at the Andersonian College, Glasgow, and Yorkshire College, Leeds, and was later appointed assistant lecturer under Professor T. E. Thorpe at the latter college. Subsequently he returned to Glasgow and was appointed assistant to Dr. J. E. Mills. While engaged on the experimental work of his first engine, however, he joined Messrs. Thomson, Sterne and Company, and during the ensuing twelve years was able to devote the whole of his time to research on the internal-combustion engine. In 1886 he joined Messrs. Tangyes at Birmingham, where he continued this work, but two years later he commenced to practise as a consulting engineer in partnership with Sir G. Croydon Marks, M.I.Mech.E. (now Lord Marks). During the ensuing years Sir Dugald Clerk held a number of important appointments, which included those of scientific director of Messrs. Kynoch of Birmingham and of consulting engineer to the Patent Shaft and Axletree Company of Wednesbury. In 1902 he became a director of the National Gas Engine Company of Ashton-under-Lyne and took an active part in the design of the engines which this firm produced. From 1916 to 1918 he was director of engineering research to the Admiralty, and he served also on a number of other advisory committees during the War. For this service Sir Dugald was created a K.B.E. in 1917. Amongst his many activities he displayed a great interest in the development of the motor vehicle, and he was a member of the technical committee of the Royal Automobile Club. In 1915 he delivered the Thomas Hawksley Lecture before the Institution on "The World's Supplies of Fuel and Motive Power." He first became a Member of the Institution in 1908 and served on the Council from 1911 to 1917, and he was a Vice-President from 1917 to 1919. He was also a Member of the Institution of Civil Engineers and was elected President for the present year, but ill-health prevented him from taking office. In 1908 he was elected a Fellow of the Royal Society and later became a Member of Council of that body. He died on 12th November 1932. Under the terms of his Will a Bequest of £1,000 was left to the Institution. Sir DUGALD CLERK, K.B.E., F.R.S., whose contributions to the scientific study and practical development of the internal combustion engine placed him in the rank of great engineering pioneers, died at Ewhurst, Surrey, on the 13th November, 1932, in his seventy-ninth year. He was the son of Mr. Donald Clerk, and was born at Glasgow on the 31st March, 1854. After serving as an engineering apprentice from 1868 to 1871, in the works of his father and of Messrs. H. O. Robinson and Co., Glasgow, he devoted the next five years entirely to the study of chemistry and physics, which he pursued at the Anderson College, Glasgow, and at the Yorkshire College of Science, Leeds, where he was an assistant to Professor J. E. Thorpe. He then returned to GIasgow, and was for a time senior assistant to Dr. E. J. 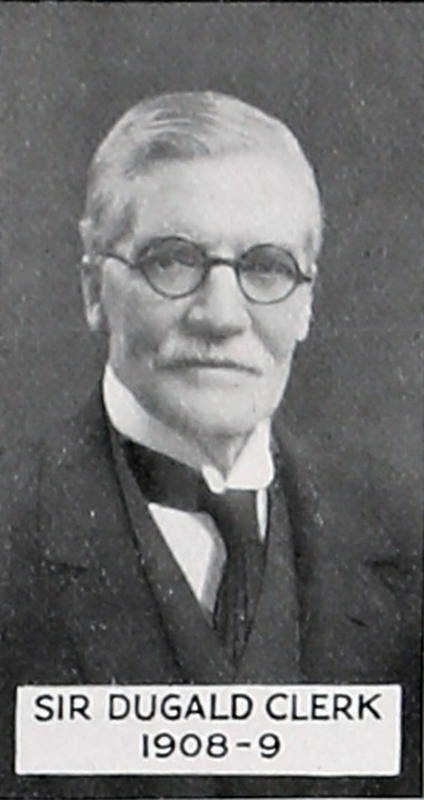 Mills, Young Professor of Technical Chemistry at the Royal Technical College. At that time (1876) the development of the internal-combustion engine, through the work of Lenoir, Beau de Rochas, and Otto and Langen, had reached the stage of the production of Otto's silent engine, and Clerk's attention was drawn to this form of prime mover by a 3-HP. Otto-Langen engine at work in a joiner's shop in Glasgow. As a result he designed an improved engine of the air pressure vacuum type, with which he experimented ; and in 1877 he joined the firm of Thomson, Sterne and Co., of Glasgow, where he continued until 1885 to invent, design, construct, and test gas engines. In 1878 he built a true compression engine developing 3 B.HP. at about 200 revolutions per minute, which was exhibited at the Royal Agricultural Society's show in July, 1879. In 1881 he produced an engine in which the two-stroke cycle (Clerk cycle) was adopted, and engines of that type were produced in considerable numbers until 1890, when the lapse of the Otto patent caused extensive adoption of the Otto cycle, and the Clerk cycle suffered a temporary eclipse until the increase in the power of internal-combustion engines rendered it necessary to adopt a type involving less bulk for a given power. From 1886 to 1888 he was engaged on this work with Messrs. Tangyes, Birmingham. In the latter year he joined his personal friend Mr. G. Croydon Marks (now Lord Marks), Assoc. M. Inst. C.E., in his practice as a consulting engineer and international patent agent, and this partnership continued until Sir Dugald's death. From 1892 to 1899 he was Engineering Director of Kynoch’s, Ltd., Birmingham, and designed new works and machinery for the production of ammunition ; and from 1902 he was a director of the National Gas Engine Company. Throughout his life he continued his researches on the internal-combustion engine and its thermodynamical problems, as well as on the application of gas as fuel and for heating and lighting. He made many contributions to the literature of those subjects and wrote a standard text-book on the internal-combustion engine. His earliest Paper to The Institution, "The Theory of the Gas Engine," was presented in April, 1882. It was discussed by many eminent engineers and scientists, and was awarded a Watt Medal and a Telford Premium. It was followed by Papers "On the Explosion of Homogeneous Gaseous Mixtures" (1886), "Recent Developments in Gas Engines" (1896), and "On the Limits of Thermal Efficiency in Internal- Combustion Motors" (1907). For this last Paper he was again awarded a Telford medal. In 1928 he contributed a fifth Paper on "Standards of Thermal Efficiency for Internal-Combustion Motors." He delivered two James Forrest Lectures before The Institution, one in 1904 on "Internal-Combustion Motors" and one in 1920 on "Coal Conservation in the United Kingdom." He was a member of the Institution Committee on Standards of Efficiency of Internal-Combustion Engines, and was Joint Secretary of the British Association Committee on Gaseous Explosions. During the war he was Director of Engineering Research at the Admiralty, a member of the Advisory Committee for Aeronautics at the Air Ministry, Chairman of the Internal-Combustion Engine Sub-Committee of that body, and a member of the Ministry of Munitions Inventions Committee. He was also a member of the Water-Power Resources Committee appointed by the Board of Trade in 1918, Chairman of the Water-Power Committee of the Conjoint Board of Scientific Societies appointed in 1917, and a member of the University Grants Committee. For his services to the nation during the war he was created K.B.E. in 1917. In 1908 he was elected a Fellow of the Royal Society, from which he received in 1924 the Royal Medal. The Honorary Degree of D.Sc. was conferred upon him by the Universities of Manchester and Leeds, that of LL.D., by Glasgow and St. Andrews, and that of D.Eng., by Liverpool University. 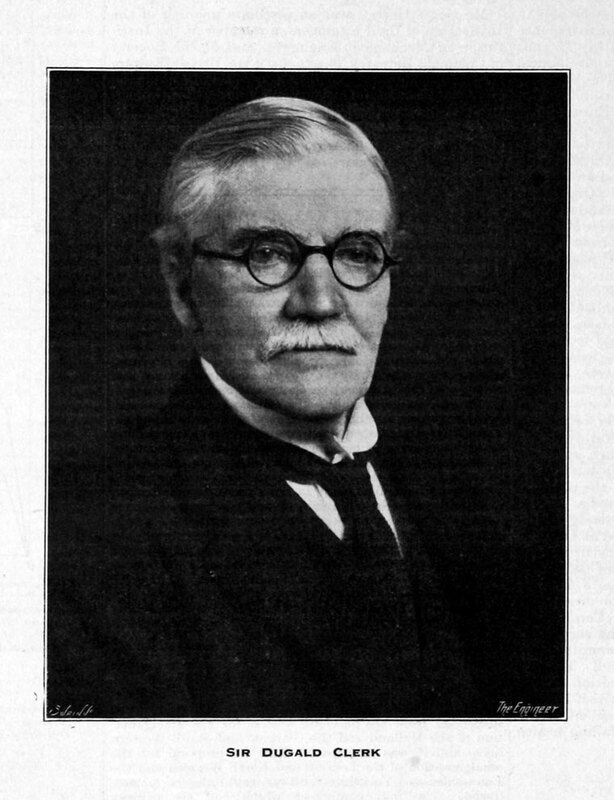 He was President of the Junior Institution of Engineers in 1905, of the Engineering Section of the British Association in 1908, of the Institution of Gas Engineers in 1920, and of the Institution of Automobile Engineers in 1908-9 ; and Vice-President of the Institution of Mechanical Engineers in 1917-19. In 1915-17 he was Chairman of the Council, and in 1923 he became a Vice-President, of the Royal Society of Arts, which awarded him in 1922 the Albert Medal for his work in connection with the development of the internal-combustion engine. In 1906 he delivered before the society a course of Cantor lectures on that subject, and in 1917 the first Trueman Wood lecture on Discovery and Invention. He was Chairman of the Delegacy of the City and Guilds (Engineering) College from 1918 to 1920, and a member of the Court of the Goldsmiths Company, of which he was Prime Warden in 1926-7. His election in 1913 to the Athenaeum Club took place under the rule which empowers the Committee to elect annually a number of distinguished men; and he was a member also of the Reform and other clubs. 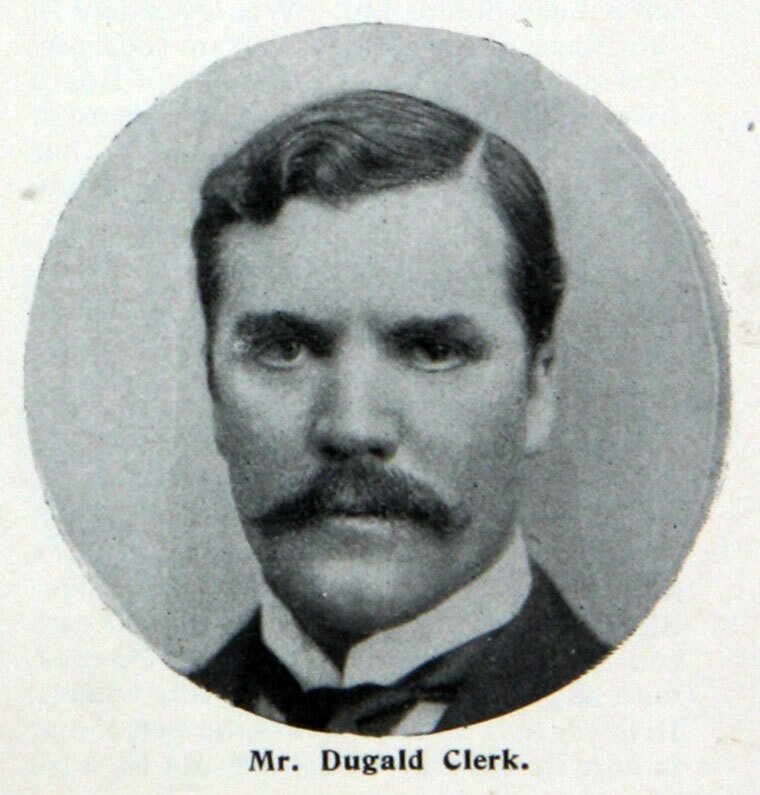 Sir Dugald Clerk was elected into The Institution as an Associate Member on the 8th January, 1889, and was transferred to the class of Members on the 12th December, 1899. In 1913 he became a Member of Council, and in 1928 a Vice-President, and he was elected President for the year 1932-33 at the Annual General Meeting in May, 1932. In the following September, however, he intimated to the Council that the state of his health would not permit of his taking office, and, as already stated, he died on the 12th November. He bequeathed to The Institution a legacy of £3,000 and a share (about one-tenth) of his residuary estate. He married, in 1883, Margaret, daughter of Mr. Alexander Hannay, of Helensburgh; she died in 1930. "THE LATE SIR DUGALD CLERK. By the death of Sir Dugald Clerk, which occurred on Saturday last at his home at Ewhurst, one of the few remaining links is severed with the band of pioneers associated with the early development of the internal-combustion engine. Clerk was born on March 31, 1854, and when he began his classical experiments on the gas engine in 1877, the Brayton engine had only recently been developed. As is well-known, this engine eliminated some of the more-obvious defects of the Otto and Langen engine, introduced some ten years earlier, and was characterised by the ignition of the charge before it entered the cylinder. In 1878, the Otto engine, operating on the cycle of Beau de Rochas, was exhibited at the Paris Exposition of that year. This engine was the true forerunner of the four-stroke cycle engine as it is known to-day, and served to establish the gas engine as a practical rival of the steam engine. The fact that the Otto engine only had a power stroke every second revolution, while the steam engine had one in each revolution, probably appeared to he a greater objection to the former at that time than it is recognised to he to-day, and Clerk at once set to work on the problem of developing a gas engine to operate on the two-stroke cycle. No greater tribute could be paid to his genius as an engineer than to record that the first Clerk two-stroke engine was exhibited only three years later, in 1881. It is hardly necessary to follow the controversy, which then commenced, regarding the relative merits of the two-and four-stroke cycles, through its various stages. An ample literature is available on the subject, and it is only necessary to say that in the absence of any revolutionary developments in design, there is unlikely to be any marked change in the present respective fields of the two types. The Clerk engine of 1881 had two cylinders, one being the working cylinder and the other being in effect a scavenge cylinder. The cranks to which the respective pistons were connected were at right angles, and the working cylinder was provided with ports in the walls near the outer end. Assuming the firing stroke to have taken place, the ports were uncovered by the piston towards the end of the stroke, and the exhaust gases were driven out through them by a new charge delivered into the cylinder by the scavenge piston. On the return stroke, the ports were covered by the piston, and the new charge compressed in the usual way. The design of this engine shows that Clerk fully appreciated the importance of effective scavenging, although at the time of its introduction, it was commonly asserted that it was desirable to combine a portion of the residual charge with the entering mixture. In a foreword to Mr. C. F. Caunters’ recent book on the two-cycle engine, Clerk himself records that his first engine ran well, but gave too little power in relation to its weight and dimensions. It was, therefore, not placed on the market, hut was followed by a lighter engine, of which many hundreds were sold. It is interesting to note that one of the earliest was supplied to drive the electric lighting plant at the Pacific and Orient Line offices in Leadenhall-street, while another operated in the old Prince of Wales’ Theatre for a like purpose. Lord Kelvin fitted one up in his physical laboratory at Glasgow University coupled to a Siemen’s dynamo, and stated that he behoved that the first house in the world in which the whole fighting was done by electricity, was his own in the University, which obtained the current from this plant. Before passing on to Sir Dugald Clerk’s later work, it may be mentioned that he was born in Glasgow, and, after a private education, served his apprenticeship, from 1868 to 1871, with Messrs. H. O. Robinson and Company, of Glasgow, some of his time being also spent in the works of his own father, Mr. Donald Clerk. His time from 1872 to 1876 was devoted wholly to a study of chemistry and physics at the Andersonian College in his native town, and later at the Yorkshire College of Science, Leeds. He joined Messrs. Thomson, Sterne and Company, of the Crown Iron Works, Glasgow, in 1877, and in that year, as already stated, began his experimental researches on the gas engine and the explosion of gaseous mixtures. In July, 188S, he commenced to practise as a consulting engineer, and from 1892 to 1899, was scientific director of Messrs. Kynoch, Ltd., Birmingham. At the time, this company employed some 4,000 hands, and had works at Witton, Birmingham, Barnsley, Arklow, and in Essex. Although Clerk’s name will always be associated with engines operating on the two-stroke cycle, he designed new works and new machines for Messrs. Kynoch in connection with cartridge making and shell forging, and was advisor and designer for railway wheel work, steel tube manufacture, and other specialised products. His researches on the specific heat of gases and on explosive pressure placed him in the front rank of scientific investigators at the time, and were of greater actual value than his development of the two-cycle engine, since they advanced the whole science of thermo-dynamics. His earlier experiments were carried out in a closed vessel, a pencil indicator, with a drum revolving at constant speed, being fitted to the cover to record the pressure changes. The apparatus represented a distinct advance on that employed earlier by M.M. Mallard and Le Chatelier. At the time the experiments were made, the specific heat was thought to be constant, but as a result of his experiments, Clerk suggested that the well-known difference between the calculated and actual pres-sures resulting from the explosion of the mixture was due in part to afterburning, and in part to an increase in the specific heat. The various theories to account for the difference need not be discussed here, and it is sufficient to say that the after-burning theory is chiefly associated with the name of Dugald Clerk. In 1900, he measured the time occupied in the explosion of coal gas and air from the moment of ignition to that of maximum pressure, using more elaborate apparatus. The cylinder of the indicator was replaced by a falling slide giving a card of over 30 in. long. By winding the cord controlling the slide over a fusee, uniform motion was obtained. The time of fail was determined by the tuning fork method. The mixture was at rest before explosion in these experiments, and Clerk observed that the time of explosion was dependent on the size of the vessel. This led him to investigate the effects of turbulence, and he arranged to have an engine motored round to expand and compress the charge several times before it was fired. Piston turbulence was avoided by motoring the engine slowly, and the turbulence due to the entering gas had thus time to die down. Clerk found that if the charge was then fired, the time of explosion was greatly increased, and the maximum pressure was reduced by over 60 per cent. An account of this early work on explosions in closed vessels null be found in a lecture by Professor Fleeming Jenkin, in the Proceedings of the Institution of Civil Engineers for 1884, and a later paper by Clerk himself in 1886. In the same year, he read a paper before the Society of Chemical Industry in which more particular reference was made to the effect of compressing the mixture before ignition. Numerous references to his later work appear in the proceedings of the leading institutions, and in bis own book on The Gas, Petrol and Oil Engine. Before passing on to his later career, a reference should be made to Clerk’s work on super-compression. In his James Forrest Lecture, given in 1904, before the Institution of Civil Engineers, he referred to experiments which he had carried out on two engines, both operating on the four-stroke cycle. The engines were allowed to take in the usual charge of gas and air, and at the end of the stroke, a further charge of air was introduced at a pressure of 7 lb. or 8 lb. per square inch above atmosphere. Clerk found that the compression temperature was diminished, the maximum temperature reduced, and the thermal efficiency raised from about 27-7 per cent, to 34*4 per cent. We believe that this was the first occasion on which the possibilities of supercharging were actually investigated. Although 60 years of age at the outbreak of the War, Sir Dugald served as Director of Engineering Research at the Admiralty, and as a member of the Advisory Committee for Aeronautics and chairman of the Internal Combustion Engine Committee at the Air Ministry. He was also a member of the Air Inventions Committee, and of the Panel Board of Invention and Research. Among his minor activities, he took a keen interest in the development of the motor vehicle, and in addition to being a member of the Technical Committee of the Royal Automobile Club, was a judge at many of the trials organised by that body. His work on the determination of mixture strength by analysis of the exhaust gases is referred to by Wimperis in his book on the Internal Combustion Engine. He was appointed a director of the National Gas Engine Company, Limited, of Ashton-under-Lyne, in 1888, and retained this position until his death. In the same year, he entered into partnership with the present Lord Marks as consulting engineers and patent agents, and frequently attended the Courts as an expert witness in patent cases. Few men have been more widely-honoured by the leading scientific institutions. His researches on the specific heat of gases and on explosive pressures resulted in his election as a Fellow of the Royal Society in 1908, and he was later made a Member of Council and was awarded the Royal Medal of the Society in 1924. He received honorary degrees from Glasgow, St. Andrews, Leeds, Liverpool, and Manchester Universities, and was created K.B.E. in 1917. He served with great distinction on the Council of the Institution of Civil Engineers, and was elected president for this year, widespread regret being expressed on the announcement that ill-health prevented him from taking office. He was Watt medallist, Telford prizeman and gold medallist of the Institution. He was also a member of council of the Institution of Mechanical Engineers, and a past president of the Junior Institution of Engineers. In 1922, he was awarded the Albert medal of the Royal Society of Arts for his work on the development of the internal combustion engine, and was chairman of the Council of the Society for two years. He was the second president of the Institution of Automobile Engineers, succeeding Colonel Crompton in 1908. He was also a past-president of the Society of British Gas Industries and of the Institution of Gas Engineers. He represented the Royal Society on the governing board of the National Physical Laboratory, and was president of the Engineering Section of the British Association at the Dublin meeting in 1908. He was also a member of the University Grants Committee and a member of the Court of the Goldsmiths’ Company, of which he had been prime Warden. His book on TAe Gas, Petrol and Oil Engine has already been referred to, and also some of his contributions to the learned societies. Among the more important of these were the James Forrest lecture before the Institution of Civil Engineers in 1904 on “ Internal-Combustion Motors,” and papers before the same Institution on “ The Theory of the Gas Engine,” in 1882, and “ Explosions of Gaseous Mixtures,” in 1886. Another important paper, read before the Royal Society in 1906, was entitled “ The Specific Heat of the Working Fluid in the Internal-Combustion Engine Cylinder.” He was also the author of the article on gas and oil engines in the Encyclopaedia Britannica, and on gaseous explosions and evaporation in Thorpe’s Dictionary of Technical Chemistry." SIR DUGALD CLERK AND THE GAS ENGINE. To the Editor of Engineering. Sir,—The interesting memoir of the late Sir Dugald Clerk which appeared in your issue of November 18, in dealing with Clerk’s association with the development of the internal-combustion engine, brings forcibly to mind the comparative agedness of this form of motive power, as measured in terms of the rapid developments of present-day engineering. As described in your memoir, Clerk commenced his experiments over fifty years ago, when the Brayton, Otto and Langen engines were already in being on the four-stroke principle, and from which Clerk evolved a more efficient and commercially successful engine, by introducing the two-stroke cycle. But in regarding Clerk as one of the pioneer developers of internal-combustion engines, more than ordinary interest attaches to references made to apparent attempts to evolve engines of this type, which antedate the efforts of Clerk, Otto and Brayton. In the year 1824, Matthew Murray, of Leeds, writing to his friend Simon Goodrich, Engineer and Mechanist to the Navy Board, on the demerits of locomotive engines and their possible developments, makes the following reference to internal-combustion engine development of that day, when he says, “Mr. Brown’s Explosive Gas Engine—this is not original, as it was attempted at least 40 years ago, although rather different. The principle was to drop, by drops, a bituminous or inflammable substance on a red-hot plate, at the bottom of a cylinder, at the same instant an admission of air caused it to explode and force up the piston, but this also has gone to the ‘ Grave of all the Capulets.’ ” Murray’s statement that “ it was attempted at least forty years ago,” shows that some of our engineers of that period were turning their minds to developing some form of internal-combustion engine, basing their principles on the motive power engendered by explosions in the base of a cannon tube, and endeavouring to put this created force to mechanical advantage. These unsuccessful experiments in internal combustion were contemporaneous with the early locomotive experiments, and as the full development of the gas engine occupied nearly 100 years from that time, it is evident that the expansive power of steam proved a readier, and perhaps easier, handmaiden to the minds and hands of our early engineers, than cpntrolling the creation of an explosion of gas in the base of an open-mouthed cylinder. The letter above referred to, from Murray to Goodrich, is contained in the Goodrich Collection at the Science Museum in South Kensington, and it; is of further interest that this letter includes a reference to attempts to create motive power by the following briefly described method: “The rotary, or circular engine, is also a thing to he desired, hut has not yet been brought to any perfection, when compared with the cylinder and piston engine,” and which can only refer to an endeavour to evolve some form of motive power, which is known to-day as the steam turbine. To-day, invention crowds on invention, and improvement displaces improvement with heartless regularity and an eager acceptance; therefore great credit is due to those early experimenters, to whom past experiences were denied, and elementary principles would he largely a matter of conjecture, and who, with temerity and ingenuity, laid the foundation on which stand the internal-comhustion engine and the steam turbine of to-day. This page was last edited on 7 February 2019, at 01:50.